Small items you could have ordered through Shelby American in 1965. The "Cobra Story" was the first edition of three made with this dust jacket, this particular one was autographed by Carroll Shelby in 1967. 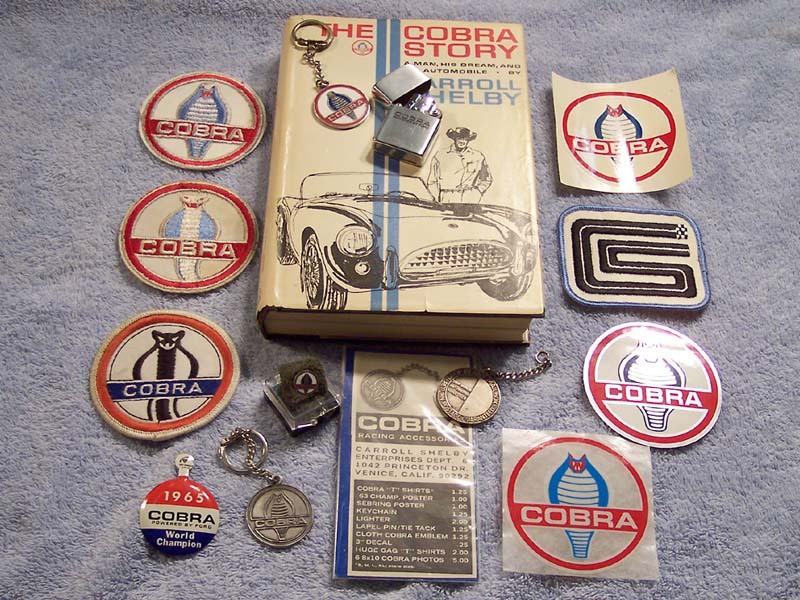 One of the Cobra key chains pictured was used by the P.R./factory rep cars at the Venice plant. It has the inscription: "If found, please drop in a mailbox....." then it lists the Venice plant address. It was taken by a Shelby American employee when he found out his job was terminated due to downsizing in July 1965. There is also a tie tack in the photo as well as a 1965 World Championship metal button that was given away at the Cobra Caravan stops throughout the U.S.